The Defence Employer Recognition Scheme (ERS) Awards represent the highest possible badge of achievement for those who employ and support members of the Armed Forces – past present and their families. The ERS was launched in 2014 by the Prime Minister to recognise employer support for the wider principles of the Armed Forces Covenant. 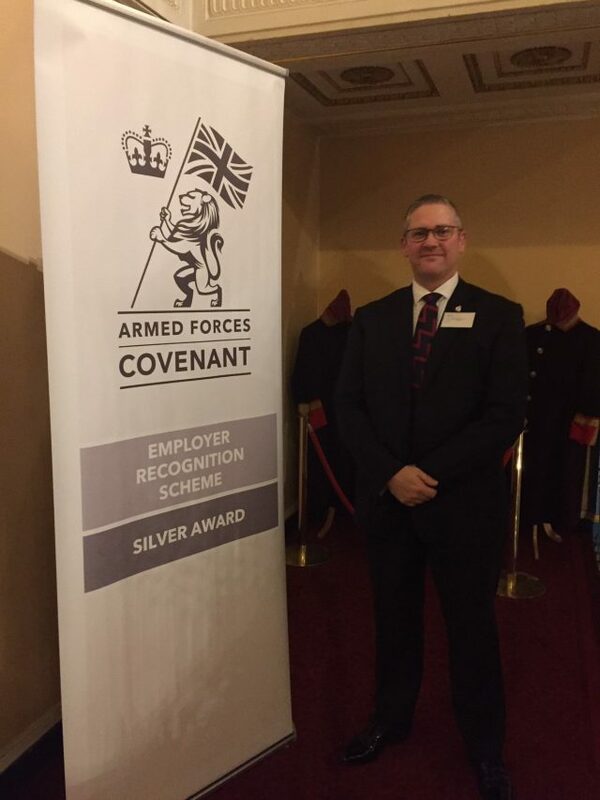 MWH signed the Armed Forces Corporate Covenant in 2015 making a promise to support the Armed Forces community and treat fairly those who serve, have served and their families. We formed Armed Forces Steering Group to recognise that promise and to embed the philosophy of the Corporate Covenant throughout our business. On Wednesday 28th November 2018 Adam Houchin and Jennifer Laptew represented the Armed Forces Steering Group as they collected the silver award for long term commitment to the Armed Forces Community at the ERS Awards Ceremony at Liverpool Town Hall. The Rt. Hon Gavin Williamson MP recognised MWH Treatment and 13 other companies in the North West all receiving their silver award “All of you are being recognised today for having gone the extra mile, turning your written pledges into concrete action and making a positive difference to our people during and after their time in uniform. You are recognising the massive contribution our serving personnel; veterans and their families make to the nation and civilian employers”. Both Jennifer and Adam, enjoyed networking with the other awarding winning organisations and meeting reservists, as well as both serving and retired personnel from the Army, Navy and Air Force, all of whom were there to thank the winners for their contributions and make the evening an enjoyable one. On receiving the award Adam who was formally Bombardier of the Royal Horse Artillery said, “I am proud to work for a company that acknowledges the contribution ex-military personnel bring to the workplace, a company that helps veterans develop their skills and build successful civilian careers”. I would like thank everyone at MWH Treatment for their enthusiasm and contributions over the years and those who have make this award possible, I hope we will continue to support our Armed Forces Community”.